I was lucky to held one of the first communicators 9210, which were shipped to Russia. Now I would like to share my impressions with you. 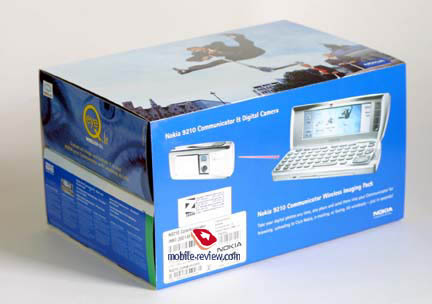 The communicator and all other compatible accessories are delivered in two boxes, combined by one pack. One of these boxes contains a digital camera Concord Q Eye, which allows to make shots of 640x480 pixels resolution. Up to 12 photos are held in the integrated memory. It is presumed that MMC-card will be suitable for this phone. A special expended slot for this card is available. The camera is powered by two usual AA batteries. According to the manufacturer, one could take up to 200 pictures without re-charging. 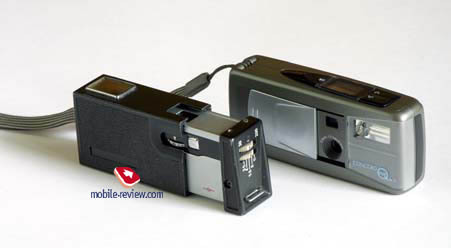 Design of the camera resembles similar German devices of 30-th. On the photos below one can see a flash, special holder for a tripod and IrDA, which allows to transmit photos to other devices, communicator in particular. All settings are rather scarce. 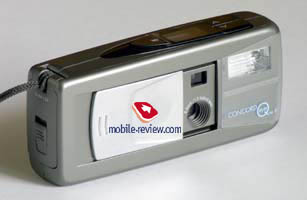 One can set a special shooting mode, flash mode, activate IrDA to receive a picture or delete one of shots. To confirm the operation or make a shot, press OK-key. Battery charging level is displayed on the LCD indicator. 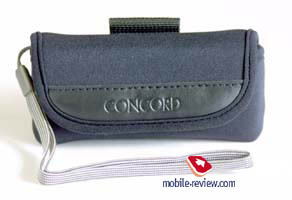 The standard kit includes also a black neoprene case, which has a holder to wear the camera on the belt. Of course, this camera can’t be used as a real camera, it’s only a pleasant accessory. Quality of taken photos is very poor and it is difficult to use this photos even as pictures of the phonebook. Look on the picture below. It is one of the examples of not bad shots, made by Concord Q Eye. As I’ve said camera is just an accessory and it can’t influence estimation of the communicator. 9230 has wide capabilities to work with photos. 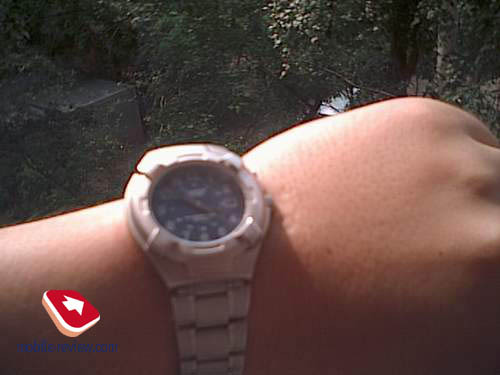 So, it is possible to apply digital camera of better quality. But we’ll speak later about it. 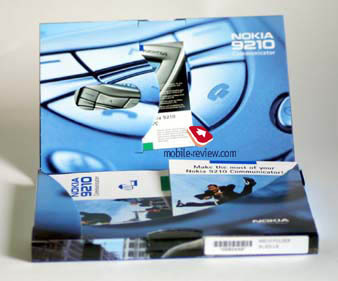 The second box contains communicator, manuals, data cable, battery and CD with software for 9210. User’s guides are beautifully packed and look like very pleasant. One of the programs, recorded on CD is PC Suite, which enables to archive data of 9210 on PC. It is also possible to move files from PC to communicator and vice a versa, using this program. Besides, there is a special option to install new applications. You can easily install PC Suite on you PC, after complete installation one can see an icon (Nokia 9210 Communicator) on the desktop. If your communicator is connected to PC, you can click this folder and view all directories in 9210. Now you can delete files or copy them to any folder you like. The process of coping needs time, because the rate is limited by the rate of port. It took about 30-40 minutes to make reserve copy of applications and contained data (about 20 Mb). I wish to see even USB-cable in the standard kit, but unfortunately it’s impossible. The other disappointing thing was that all data were lost during first synchronization. May be OS of my sample was unstable, but I had to reload the system and repeat the process once again. There were no any reasons to loose data: PC was normally switched off, there were no other problems too. But nevertheless it happened. After you made a reserve copy you could restore all information or separate files. The user of 9210 can also synchronize to-do list from organizer, mail programs and contact list with PC. Products of Microsoft, installed on PC are preferable while synchronization, though the communicator supports Lotus Notes and Lotus Organizer as well. Control panel of PC Suite enables to receive all information about the device, view, where data are kept and etc. One of the most interesting items is Conversion Settings. It enables to convert files of text editor integrated in the 9210 and electronic tables to PC format. For example, you can convert RTF-files downloaded from PC with to Word format in the communicator. By default it is Microsoft Word. We can’t say that this communicator has compact dimensions (158 x 56 x 27 mm). The 9210 resembles its predecessor – 9110. They have similar appearance. The weight is also not light – 244 g. Usually communicator is worn in the bag, not on the belt or a pocket. 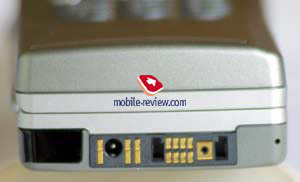 A system connector, charger connector and IrDA are placed on the bottom of the communicator. Antenna is situated on the topside of the device. When it is up, the signal is stronger. On the rear part of 9210 one can see a special place for MMC-card (standard card has 16Mb memory), battery is positioned above it. The battery is reliably fixed and doesn’t have any backlash. Above it one can note a loudspeaker; microphone is situated on the bottom part of the phone. This communicator can be used as a usual mobile phone. The main peculiarity is that keypad and display are positioned on the opposite side to loudspeaker and microphone. Probably it is made for more comfortable using of external screen. If it was lower, it would be not so convenient to read or input text information. The handset is equipped with lithium-ion battery of 1300 mAh capacity (3,7W). Time of full re-charging is 2.5-3 hours. Operating time in the talk mode is 4-10 hours, standby mode – 80-230 hours (according to manufacturer). In reality it worked about 4 days in case of 20 minutes of talking, using the phone in PDA-mode (1.5-2 hours), using speakerphone function and without switching off the backlighting. It’s not bad result, taking into account that 9210 has a color internal TFT-display, capable to support up to 4096 colors. The resolution of the screen is 640х200 pixels. So, this communicator is a leading one in its class by operating time. One can use the communicator as a usual phone (in the phone mode). When the device is opened it performs as a full PDA with the color display, advanced organizer, applications to watch video, view graphics, such functions as voice memo and others. 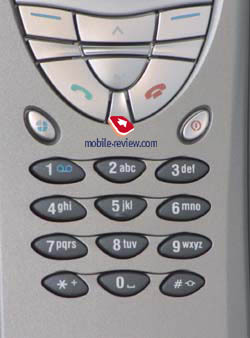 Besides, 9210 has a speakerphone function and can be used as a mobile phone. Later we’ll call this mode as PDA-mode, though it has all functions of the phone. 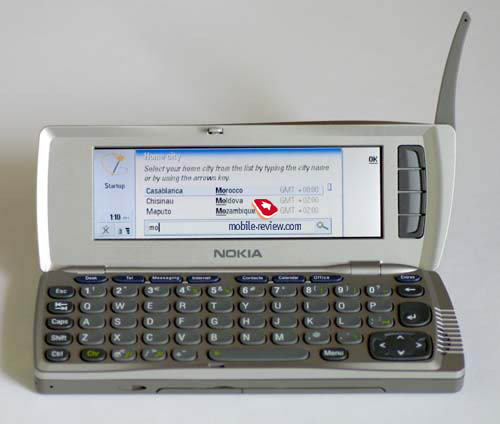 In the phone mode 9210 resembles usual business phone from Nokia by its functions, for example Nokia 6210. 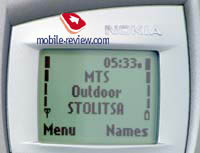 External display is smaller than Nokia 6210 has, indicators of the signal level and battery status have only 4 points. In PDA-mode these indicators has also 4 points. External display contains such information as name of the provider, time, active profile. Besides usual profiles one more was added. It is called Flight. It allows switching off the phone mode and using it only as PDA. It is necessary to provide safety during the flights. A special key, placed on the left-hand side above the keypad, is used to activate profiles. Alphanumerical keypad is made of rubber and it is very pleasant to touch. Display and keypad have a blue backlighting. The menu structure is standard. Shortcut number navigation to provide fast access to menu items is available. Main menu includes only 5 items: Messages, Calls (calls lists, cost, duration and other), Settings (safety, time, greeting, auto dialing, speed dialing and etc. ), Calls divert and IR-port. This menu is not rich, but it is quite comfortable for using this device in the phone mode. You can dial a phone number only when you are in the phone mode (when the communicator is closed). 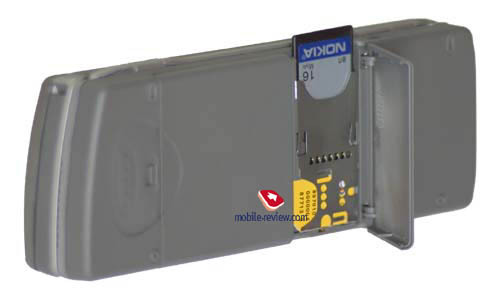 Sound quality and volume are quite sufficient, they do not differ from параметров Nokia 6210. You can switch off the phone if press power on/off key, which is placed on the right side above the keypad (PDA continues to work). 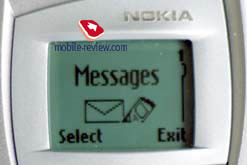 Phonebook, which is kept in the phone memory and Sim-card memory, is available in the phone mode. 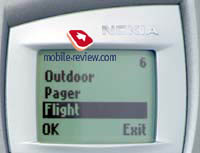 All features of the phonebook are similar to one in Nokia 6210. All changes which you make in the phone mode are visible in PDA mode. Both modes are compatible. In the second part of this review we’ll speak about PDA-mode.